Kodak has introduced two new all-in-one printers, the ESP 9 and ESP 7. Featuring an intelligent paper tray system which automatically adjusts settings based on paper type, size and amount, the Kodak ESP 9 and Kodak ESP 7 also offer Wi-Fi printing and a 10” one-touch control panel on the ESP 9. Both models promise to save consumers up to £75 a year on ink, compared to other leading consumer inkjet printers. 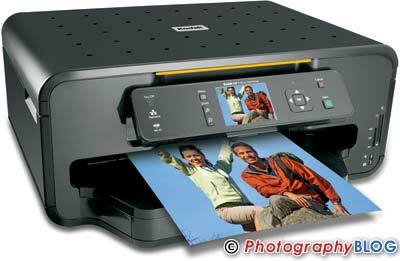 The Kodak ESP 7 and ESP 9 AiO printers will cost £199.99 and £299.99 respectively, available from November. London, September 22, 2008 — Eastman Kodak Company (NYSE: EK) welcomes consumers to an even more affordable and effortless way to print, copy and scan photos and documents with the new KODAK ESP 7 & ESP 9 All-in-One (AiO) Printers. Kodak has combined the latest in printing technology with affordable, premium-quality inks to create sleek and powerful printers that allow consumers to print up to twice as many photos and documents for their money, saving consumers up to £75 a year on ink*, compared to other leading consumer inkjet printers on the market. The KODAK ESP 7 & ESP 9 AiO Printers feature the most intelligent paper tray system in the consumer inkjet printing industry. This new feature automatically adjusts settings based on paper type, size and amount to ensure that consumers are more productive when printing. Additionally, secure Wi-Fi printing increases efficiency and flexibility by the ability to print from anywhere in the home to one cost-efficient printer. The 10” one-touch control panel on the ESP 9 AiO Printer is a consumer inkjet industry-first that makes printing, copying, scanning and faxing even easier. 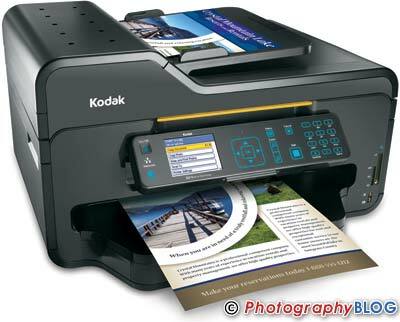 The All-in-One Printers use Kodak’s premium pigmented inks that come in a simple two-cartridge setup – a black cartridge (£6.99 RRP) and a five-ink colour cartridge (£9.99 RRP). The exclusive KODACOLOR Technology embedded in each printer enables consumers to cost-effectively print crisp documents and KODAK lab-quality photos1 This technology is a combination of four key elements—pigment-based inks, micro-porous photo papers, colour and image science, and a Micro-Electro-Mechanical-Systems (MEMS) print head. Furthermore, Kodak’s Home Center Software includes exclusive Facial Retouch software that enables consumers to enhance their personal photographs right at home by automatically reducing blemishes and enhancing facial features in just one click. - The KODAK ESP 9 AiO Printer (£299.99) is perfect for the home office user with additional features such as fax capabilities, an auto-document feeder, built-in duplexer and built-in Wi-Fi and Ethernet connection to get the most of a home computer network. More information about the results of Wilhelm Imaging Research and QualityLogic findings regarding KODAK ESP All-In-One Printers and Kodak’s advanced pigmented inks and papers can be found at www.kodak.co.uk/go/inkdata. *Results based on average annual print volumes compared to leading consumer inkjet printers. Actual results may vary. For more information visit kodak.co.uk/go/inkdata. **As compared to leading consumer inkjet printers total ink load replacement costs using manufacturers recommended ink cartridges; excludes single cartridge printers. Based on IDC cartridge pricing survey data obtained January 2008. 2. Print speed based on using KODAK ULTRA Premium Photo Paper – Studio Gloss, using WINDOWS OS-based PCs that meet recommended system requirements. Actual results may vary. 3. Based on testing by Wilhelm Imaging Research (WIR), using Kodak inks and a full range of Kodak photo and document papers in all common consumer display and storage environments. For more information, visit http://www.kodak.co.uk/go/inkdata and http://www.wilhelm-research.com for details. 4. Based on fastest document print mode using WINDOWS OS-based PCs that meet recommended system requirements. Actual results may vary. The ESP 7 and ESP 9 AiO printers (RRP £199.99 and £299.99 respectively) will be available from November online at kodak.co.uk. To learn more, visit http://www.kodak.com/, and our blogs: 1000words.kodak.com, PluggedIn.kodak.com, and GrowYourBiz.kodak.com.